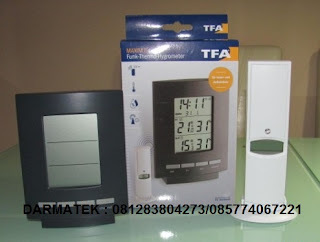 Description TFA "MAXIM II Wireless Thermo-Hygrometer"
*Transmission of outdoor temperature and humidity via up to 3 transmitters ( max. 100 m) . *Indication of indoor temperature and humidity, comfort level, max.-min.-function ( for temperature with time and date of recording), radio controlled clock, date, for hanging or standing. *Measuring range temperature outdoor -40...+ 60°C(-40...+ 140° F). indoor -10...+ 60° C, ( +14...+140°F), reversible°C/°F. *Humidity 1...99% , time zone ± 9 hrs.